Are you a residency-seeker who cares about your future trainee lifestyle? Need to generate a list of IMG-/DO-friendly programs, but don’t know where to start? Do you care about things like your residency salary, call schedule, or hours/week? How about vacation days or moonlighting opportunities? Want to know how competitive your application will be to a particular program? Then bookmark both FREIDA and this article now. 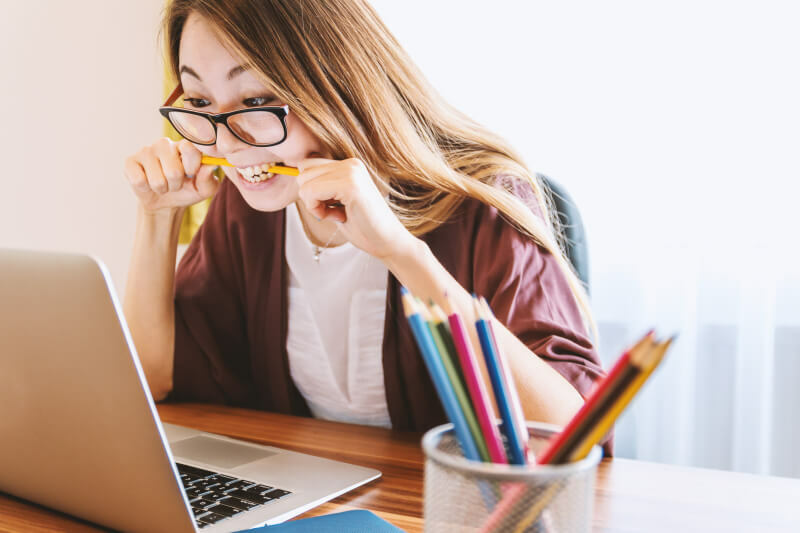 Finding credible information about residencies is difficult. Making lists of programs that meet specific criteria is even more of a nightmare. 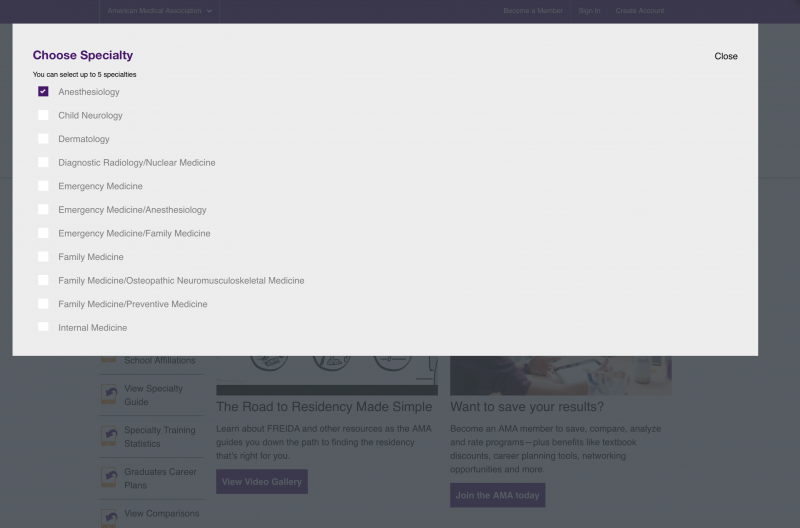 Wouldn’t it be great if there was a “residency search engine”? One with up-to-date, relevant information that you want to know but are afraid to ask? In FREIDA, you can sort for a variety of things. In this screenshot, I’m searching for university-based anesthesia programs. FREIDA is an excellent source of information. However, there are some quirks in the program that make some of the most useful tools harder to find. I’ve talked to students who wasted weeks because they didn’t know how to use FREIDA properly. Don’t be one of those poor souls who search through every program’s website by hand. Learn how to use FREIDA properly! We’ll start by laying out the two most important ones. 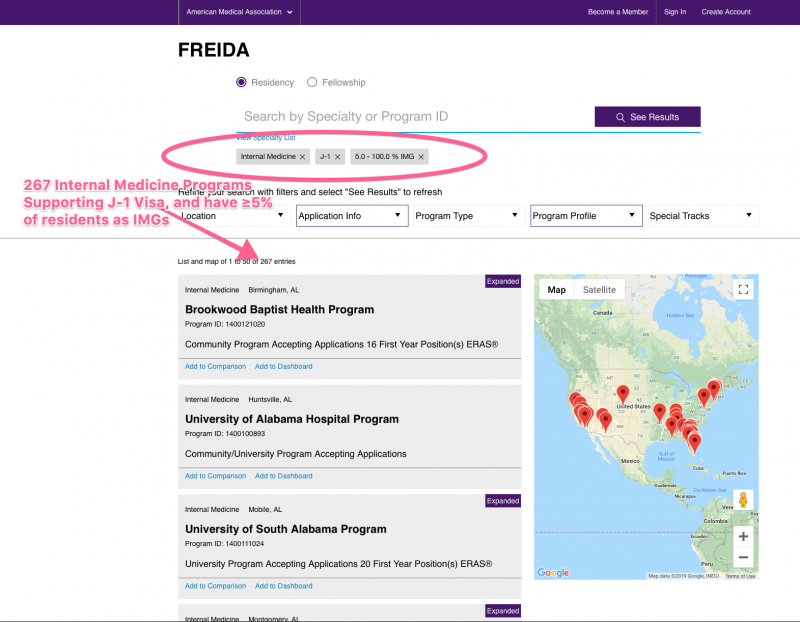 One of FREIDA’s most useful functions is filtering programs based on specific criteria. However, it’s not immediately clear how to do so. No filters! What gives? To get to the filters, you must first select a specialty and perform a search. Once you’ve performed a search, you’ll see the filter criteria. 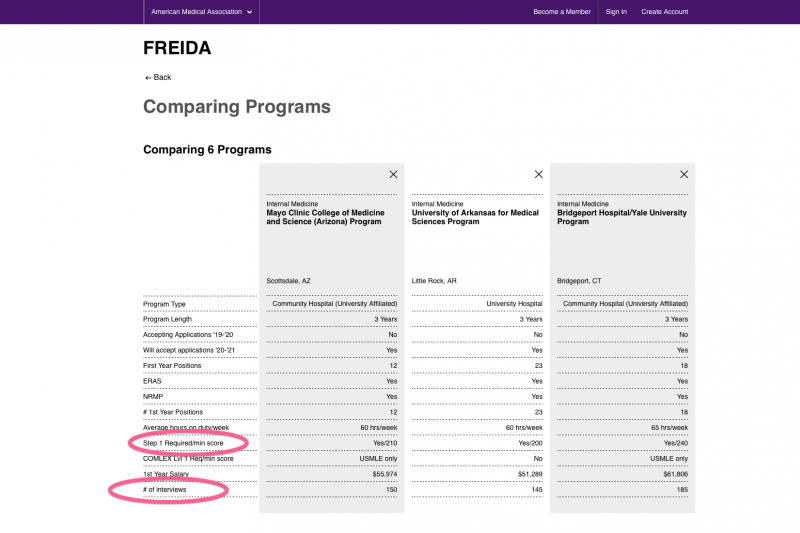 FREIDA also allows you to compare programs’ key stats at a glance. However, like with the filters, the “Comparing Programs” tool is hard to find. Next, click on an individual program’s page. Now you can see the “Comparing Programs” view. Again, not the most user-intuitive design. However, it’s easy once you know what you’re looking for. One thing that vexes IMGs and DOs is to finding IMG or DO-“friendly” programs. FREIDA makes this super easy. (To read The IMG’s Guide to Obtaining Residency in the United States, click here). 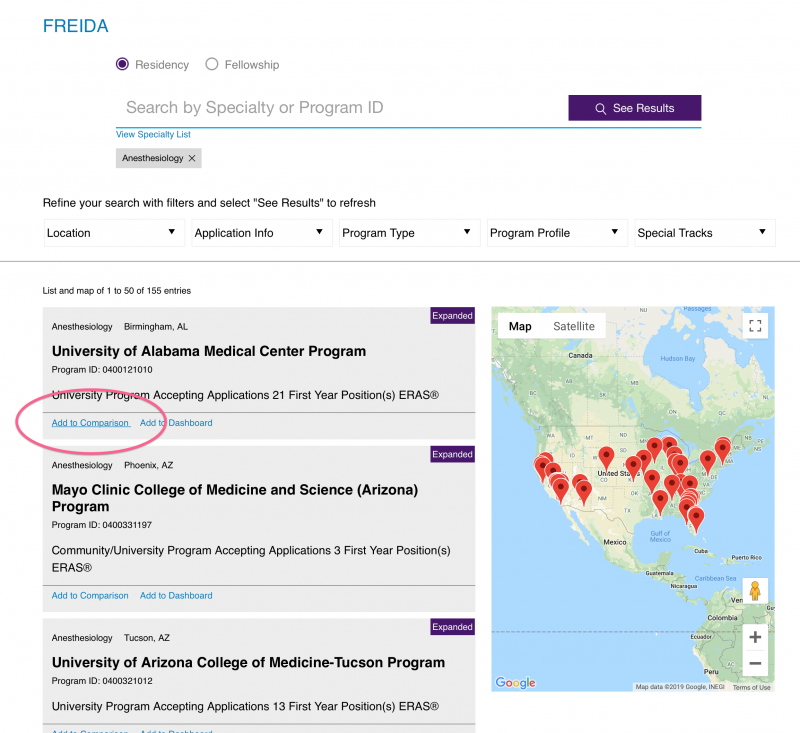 On FREIDA, you can refine your search by state and specialty. Even better, you can sort for programs which offer J1 or H1-B visas (see below). You can also find programs that have had IMGs in the past. As you can see above, I can search for internal medicine programs that sponsor J-1 visas. Additionally, I can even find programs that have above a certain % of IMGs. (In the above example, there are 267 IM programs that support J-1 visas, and have ≥5% of residents as IMGs). This is an effective way to generate a quick list. Once you have a preliminary list, you can go to the program’s actual website. There you can see further information, including IMGs among their current residency class. 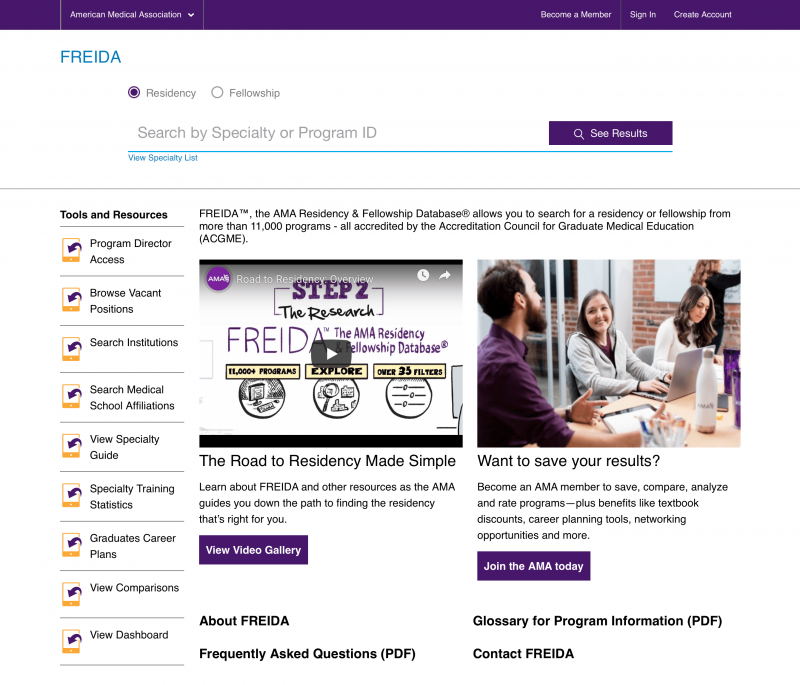 The merging of previously DO-only residencies with MD residencies has created some confusion. Are COMLEX scores going to be ok? Or do all DOs absolutely need to take the USMLEs to be considered for a program? What is a Residency Program’s Lifestyle Like? No question: residency can be brutal on your personal life. However, not all residency programs are equal. The best information source on resident lifestyle is talking to current residents. However, when you’re deciding where to apply, talking to residents isn’t an option. Here, FREIDA can give a good lifestyle overview. Here are some examples, taken from the Beth Israel Deaconess Anesthesiology Program. The “Comparing Programs” tool compares 1st-year salary and average duty hours/week. However, you’ll find more detailed information on each program’s page. What criteria you use for choosing a residency are up to you. Many (including myself) take the “I can do anything for ___ years” mentality. However, 4 years of residency have changed my perspective a bit. (This is likely the topic of a different article). Suffice it to say I’m glad I didn’t choose the program with the most grueling reputation. (It certainly wasn’t the easiest, either). Whatever you choose, there is a lot of useful information in FREIDA on resident lifestyle. 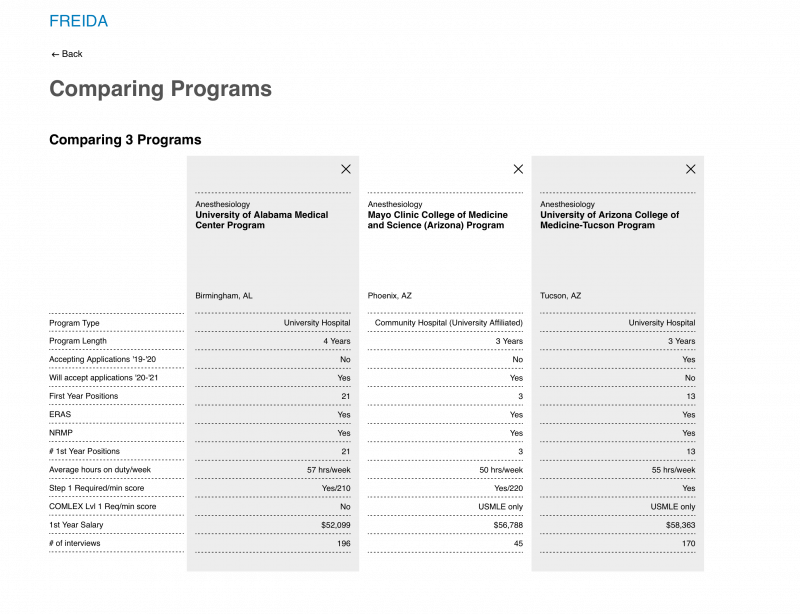 How Competitive is a Given Residency Program? Wonder how competitive your application would be at a given program? FREIDA can help. Ever wonder what a program’s minimum Boards scores are? You can see programs’ minimum Boards scores. 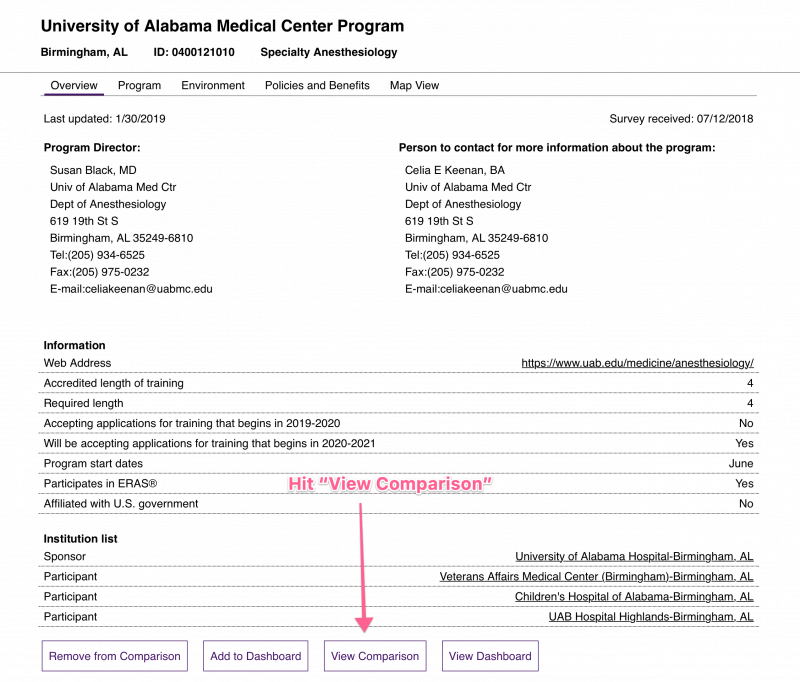 For a high-level overview, use the “Comparing Programs” tool. Here you can see quick stats, like USMLE Step 1 cutoffs, # interviews, etc. Programs list the number of interviews they give, and first-year spots available. This can give you a sense of how competitive it is to get an interview. Next, you can get even more information by going to each program’s individual page. 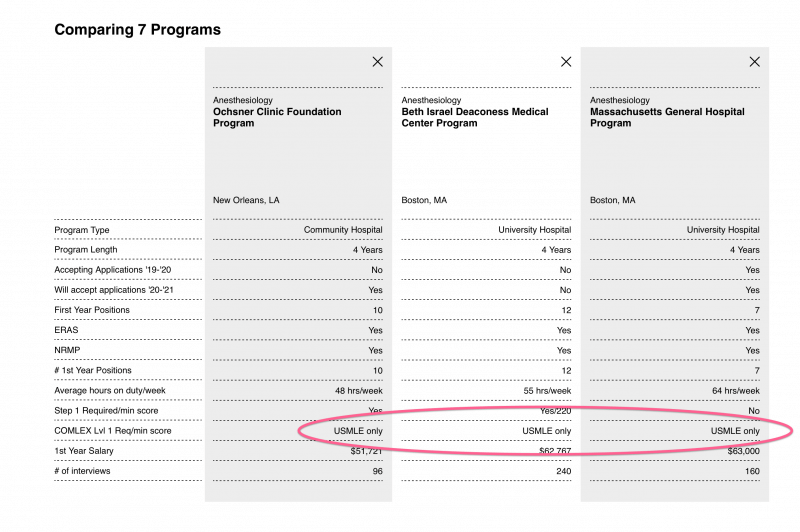 For example, under “Program” some residencies also share residents’ average Boards scores. No one likes to waste time/money. 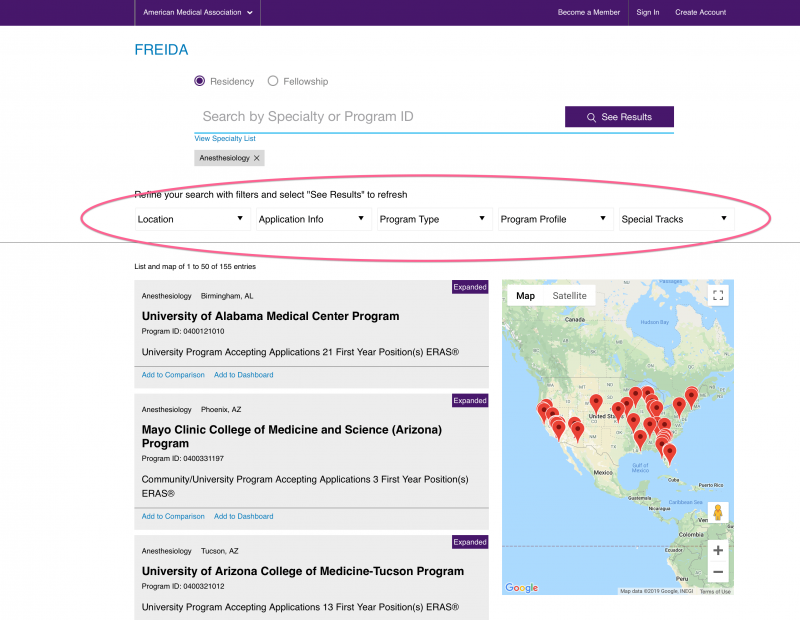 FREIDA can help you find programs with varying levels of competitiveness. I know what you’re thinking: “FREIDA sounds perfect. What’s the catch?” Honestly, it is by far the best tool I’ve found to find up-to-date information on programs. However, nothing is perfect. 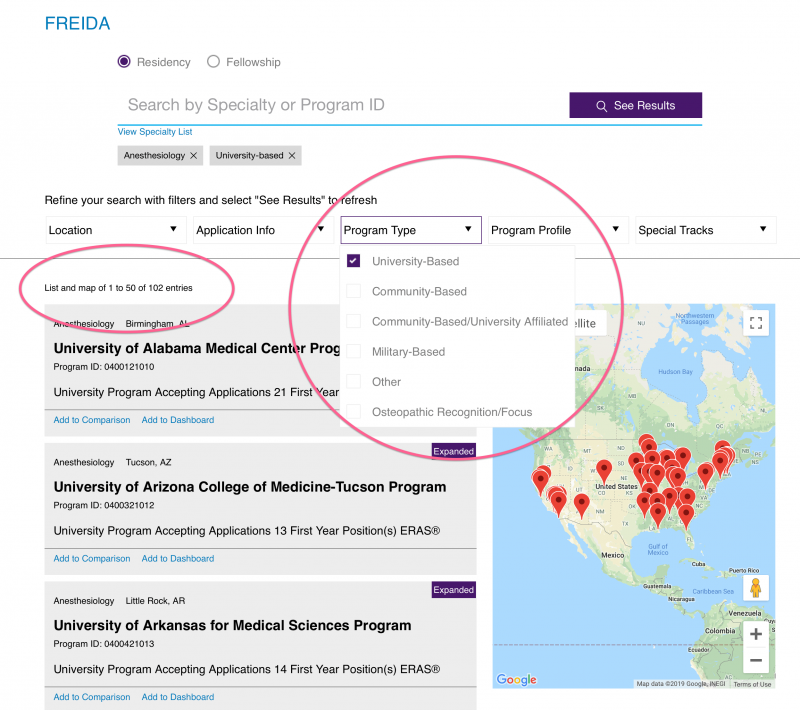 FREIDA is based on surveys from the programs themselves. While I doubt many programs would misrepresent themselves, not all programs share all information. You can look at each program individually for even more detailed info. Note that not all programs report all info. 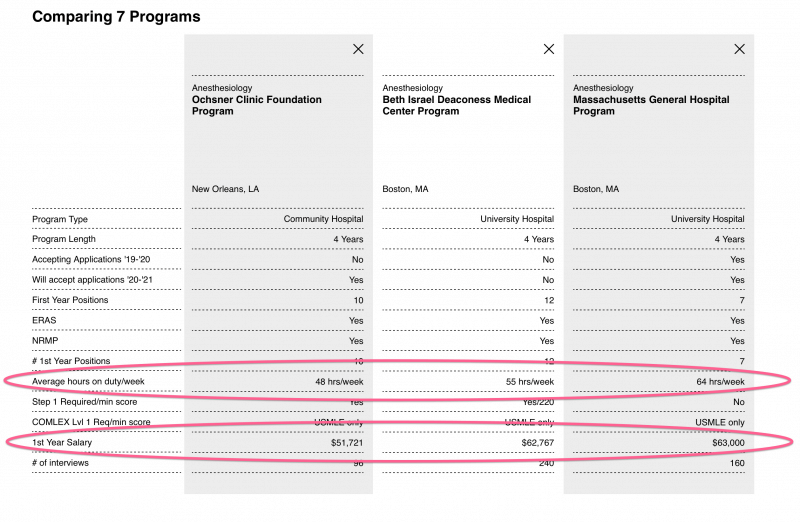 For example, the Harvard-MGH Anesthesia program (above) only lists basic information. They don’t include cut-off Step 1 scores, % of residents who are IMGs, or what visas they sponsor. 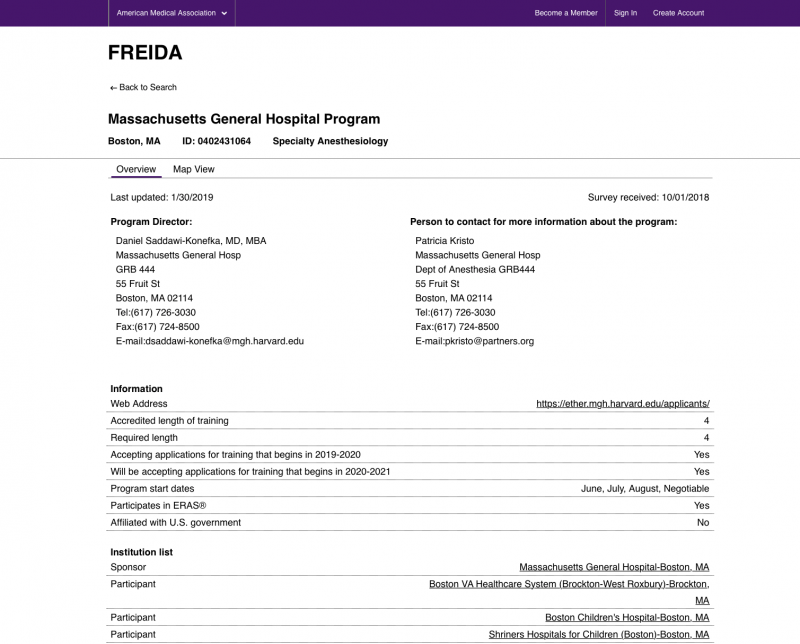 Having completed my residency there, I know that they have IMGs and sponsor visas, but programs like MGH Anesthesia won’t show up in your searches. Although you can use FREIDA at any time, there are likely two times you’ll find it most useful. First, as we’ve discussed, you can use it to generate a list of programs you might want to apply to. However, I’d also recommend using it during your interview season. Boards scores are essential for getting an interview. However “program fit” determines where you’ll match. One way that you can show you “fit” with a program is knowing specific knowledge of a program. Students often discuss their residency program search as excruciating. IMGs and DOs, in particular, have it rough. 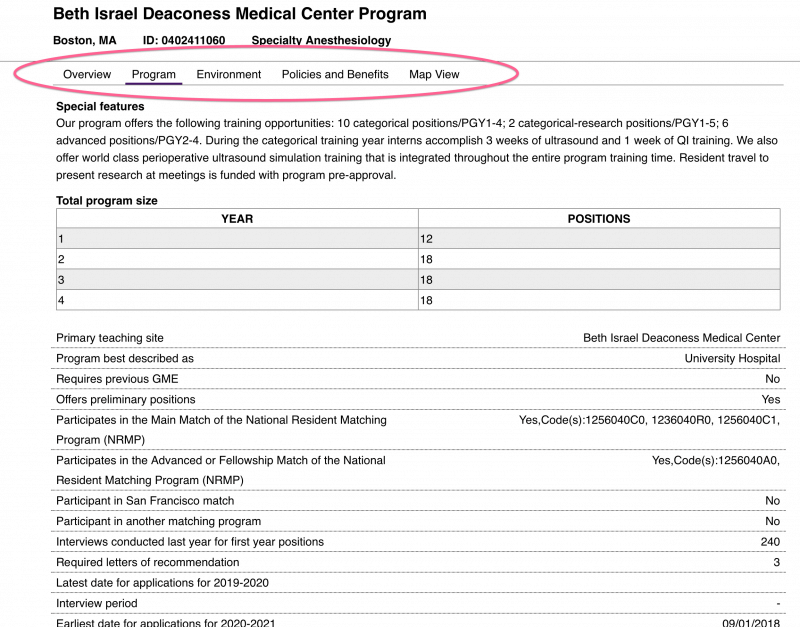 IMGs have made spreadsheets with every program for a given specialty. They spent countless weeks painstakingly combing through each program’s website to determine “IMG-friendliness.” Even worse, much of the information was suspect, as many of the sites were out-of-date. 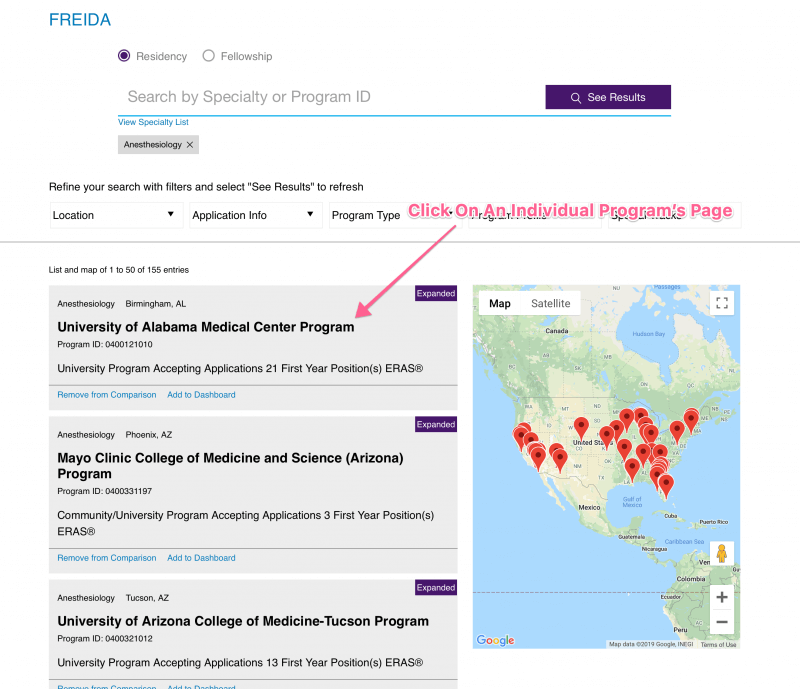 Most med students don’t know there’s a much better way to search for residency programs. Heck, I barely used FREIDA when I was a med student. I certainly didn’t know about its power until writing a different article. Now, I’m convinced it’s the best source of relevant, up-to-date training program information. What do you think of FREIDA? Have you used it? Let us know in the comments!